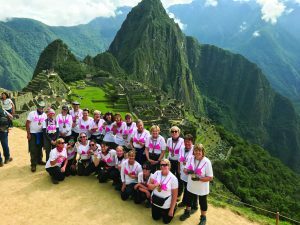 WOKING-based grant-making breast cancer charity Walk the Walk is celebrating a multi-million pound fundraising year. It included the ever-popular London MoonWalk which marked its 20th anniversary, and helped raise £7.5 million. As spring got under way, Walk the Walk headed to Scotland to celebrate the opening of the new Maggie’s Centre, of which the charity is the principal fundraiser. In May, a £10,000 donation was made by Woking-based lingerie business HanesBrands. Founder and chief executive Nina Barough said: ““I think our 20th year was certainly marked in style. Our walkers looked magnificent! The year got under way in February when a group of Arctic explorers took on the charity’s backcountry skiing marathon in Sweden. Then in June 83 walkers took part in the MoonWalk Iceland challenge which included whale watching, walking by volcanoes and visiting lava fields and boiling mud pools. A trip to Peru followed when walkers embarked on the Inca Trail. Walk the Walk welcomed Woking Mayor Graham Cundy and his wife Sarah, as well as Woking MP Jonathan Lord to a private viewing of Bust Up!, an exhibition of bras, at The Lightbox gallery. Also taking place in October, a crowd of walkers headed to Ireland for the second Dublin Marathon. The event saw the team passing through many of Dublin’s famous Georgian streets, starting near the famous Trinity College, crossing the city, north and south of the river Liffy. At the end of Breast Cancer Awareness Month, law firm Squire Patton Boggs presented £50,000 to Walk the Walk. The money had been raised over the last three years, through employees at the law firm taking part in The MoonWalk London. The year was rounded-off at New York City Marathon in November, which saw Nina Barough joining a gang of walkers for the much-loved challenge. This event is where Walk the Walk had its beginnings, after Nina dreamt about taking part wearing a decorated bra, and turned this into a reality back in 1996.